I thought I'd throw down a little plug for these guys because I think their product is really neat! I haven't been able to try them as of yet but think it's a brilliant concept. Their "Tulip" goblet is a 187.5ml single serving of wine. All you have to do it peel back the seal and your ready to drink! These strike me as an amazing tool for a picnic or pool adventure!! I'm not sure about the availability of the product here in the US but I hope they will be a widely distributed product in the near future. The only thing that I would be interested in finding out is the average shelf life of the glass and if the seal is strong enough to protect the wine. 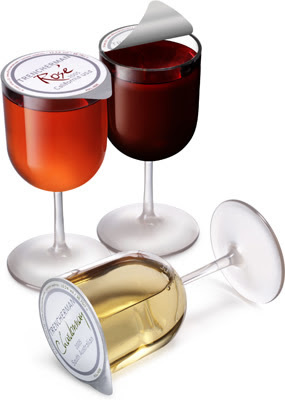 Picture courtesy of the Wine Innovations website! Cheers! This is an excellent idea! But imagine the homeless people all standing about with wineglasses, surreal ! Wine Innovations is not in production yet, due to having to pay off the previous manufacturer of this product to prevent further legal action. I am also taking them to the UK High Court for damages. Would not buy this product. yippie!! lets generate a bunch of trash because we're to lazy to carry glasses. awesome idea. i don't know this concept will work or not idea is really cool..!